Gold Bar is a small city in southern Snohomish County with a population of 2,075. It is in northwestern Washington on the Skykomish River and adjacent to Wallace Falls State Park. The city, along with its neighboring community May Creek, are the last stops going east over Stevens Pass through the Mt. Baker-Snoqualmie National Forest. Other cities close by include Sultan, Woods Creek, and Monroe; the major metro area of Seattle-Bellevue is just under 50 miles to the southwest. 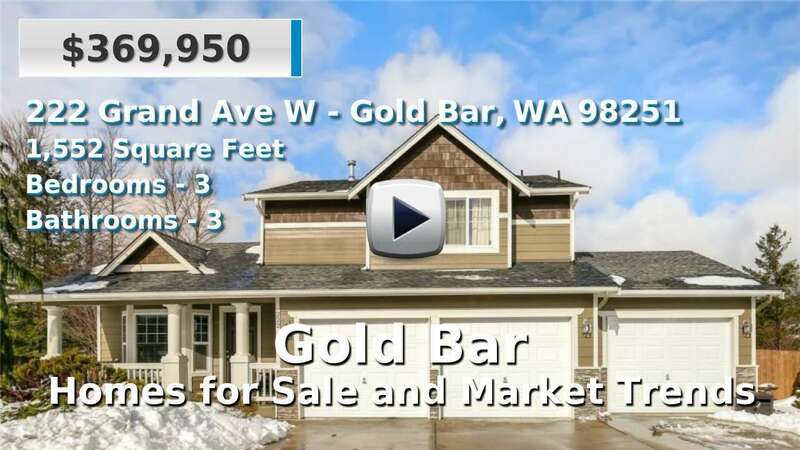 Residents of Gold Bar enjoy their rural atmosphere and homes for sale here are newer than average, with a typical commute of about 35-40 minutes. 5 Beds | 3 Baths | 4620 sq. Ft.
3 Beds | 2 Baths | 1296 sq. Ft.
4 Beds | 2 Baths | 1654 sq. Ft.
3 Beds | 2.75 Baths | 1809 sq. Ft.
3 Beds | 2 Baths | 1186 sq. Ft.
4 Beds | 2 Baths | 2030 sq. Ft.
4 Beds | 2 Baths | 1770 sq. Ft.